Bonus Point: There's a double rainbow. Bonus Point: The player can eat it. Bonus Point: It's a stack of gold coins. For the potato I got this! I got it from FFXIV myself^ You technically can't eat it but you can cook it into a dish! 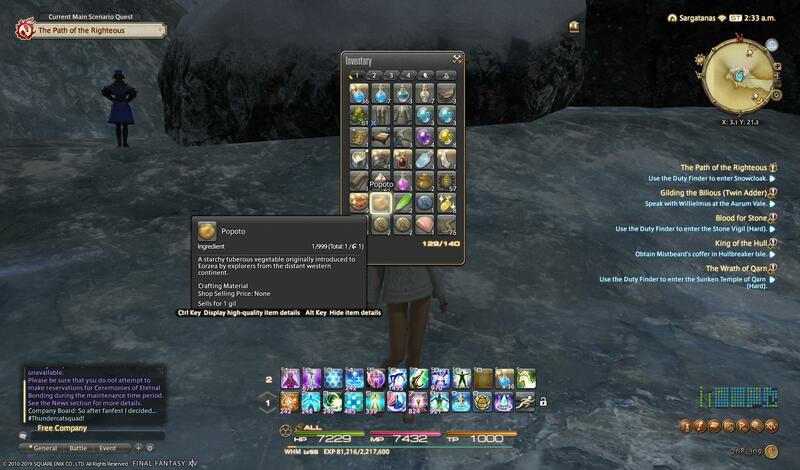 This picture also contains an allagan gold coin so that cover the coin too, but I am not getting the bonus points, but this is in fact my own screenshot! Bonus Point: It's a jug of beer. For now, here's my Rainbow and Coin submission. I'm giving 48 hours for anyone to get in their remaining screenshots before I end this. Here's my screenshots for coins, alcohol, and potato.